The first experimental platoon of the Polish Tytan future soldiers is expected around 2012, with 3-4 different Individual Battlesystem configurations. The field trials will start in 2013 © M. Sitarski, courtesy of Remigiusz Wilk. 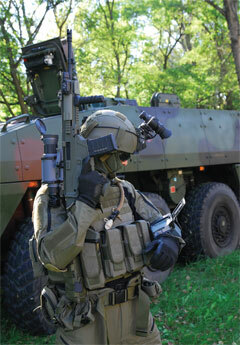 The year 2011 will be the decisive year for the Polish soldier modernisation programme or Individual Battlesystem Tytan. In the beginning of January 2011, the Bumar-lead consortium transferred the Advanced Individual Battlesystem project design guidelines which is a concept design, an technical-economic analysis and a staff requirement, to the Polish Land Forces Command and newly formed Armament Inspectorate. The project design guidelines focused on four capability groups: C4I system, reconnaissance and command system, uniform and protection and armament which were created by the 13-company consortium created in 2009 and lead by the Bumar Ltd the dominant entity within the Bumar Group and others which included FB Lucznik Ltd, PCO plc, PSO Maskpol plc, Radmor plc, CNPEP Radwar plc, OBRSM Tarnow Ltd, WB Electronics plc and ZM Tarnow plc. When the task was completed the consortium, rather than disbanding was declared open for new companies to join and to compete for the next phase of Individual Battlesystem development. According the timetable in the first half of 2011 the military is expected to finish the assessment of the concept design and will determine the operational and technical requirements of the Tytan. That will mark the beginning of the research and development phase, which is divide into three stages. The first stage will be an integration of all currently existing components as well as their modification to adapt them for a future net-centric system. The first experimental platoon of the Tytan should be created around 2012 with three or four different Individual Battlesystem technology demonstrator configurations: a commander, a scout, a shooter, a support weapon operator. The mechanized infantry squad together with Rosomak APC as well the armoured infantry squad with the future Polish IFV, probably based on the Anders modular combat platform and will be the basic combat cell for the Tytan system. The field trials of the system are expected in 2013. The second stage, which should be finished up to 2015, will see the system gain additional components which are currently under development, such as a physiological monitoring system, a future part of Tytan co-developed with the Military Institute of Aviation Medicine or selected during or after the field test. During this stage, the prototypes of the Tytan system will be completed, and then the user testing will be carried out. The timetable concludes around 2017-2018, with a final stage for the updating and improvement of the system with then-current technology development as well as the implementation of the Individual Battlesystem for serial production. In the meantime, before the Tytan system is fully introduced to the Polish Land Forces, the Army may purchase in separate tenders for components of the future system including weapons, uniforms, radios and personal armour. In the long-term plans for the development of the Polish Individual Battlesystem after 2020, there are ideas to introduce a scout helmet with observation day/night devices, IFF and laser threat detection and warning system as well as new liquid personal armour which is based on non-Newtonian fluids as well as an exoskeleton. In the Bumar-lead consortium companies responsible for the Tytan C4ISR system are WB Electronics plc, Radmor plc with 46.14% of Radmor’s shares being purchased in December 2010 by WB Electronics and CNPEP Radwar plc. The heart of the communication system in the industry proposal is a 16-channelRadmor R35010 personal radio. This was designed for operation in small area networks and enables two-way half duplex communication at a distance of up to 800 m. Every R35010 has it own unique number, which enables the identification of the device and tracks its location as well creating up to 64 separate radio networks. The radio operates in the 2.4 GHz frequency band using a Direct Sequence Spread Spectrum system with audio-signal data packets for burst transmission. It enables the transmission of simultaneous voice and data using the same channel with 19.2 kbps and just data with 57.6 kbps. The transceiver unit co-operates with a wireless headset and wireless PTT switch. The Tytan’s computer is an open-architecture design consisting of nine elements: central processor unit with cryptographical protection, communication module, visual signal management unit, acoustic signal management unit, energy management unit, battery pack, memory unit, GPS receiver. All are integrated into a single one box with a supplementary idea to integrate personal radio with them and a display unit. The computer system is responsible for following functions: navigation, sensoric such as physiological monitoring, digital compass, IFF, CBRN monitoring, battery monitoring, communication, audio-visual, control and information. In the Bumar-lead consortium project design guidelines the Tytan’s battle management system (BMS) is at the platoon level. The problem is that the Polish Land Forces are currently looking for a new BMS for the tactical level from the battalion down to vehicle level for the so-called Weimar Battlegroup which combines the France, German and Polish military forces. The setting up of the joint battlegroup is planned by early 2013. There are at least four Polish companies developing their own BMS at battalion and lower level (PIT plc, Teldat rp, Kenbit rp, WB Electronics plc) and there can be many possible foreign competitors if the Land Forces put the battle management system out to open tender. Most probably who wins the contract will be supplier the BMS for Tytan as well. The introduction of the Individual Battlesystem Tytan should be a real revolution in uniform and personal protection systems for the Polish Army. The older versions of battle dress uniforms will be replaced by new uniform system with an ergonomic design created with non-flammable fabric with high levels of concealment against night vision systems. There were some works parallel to the Tytan system which led military to approve the new wz. 2008 combat uniform, but it has not been purchased or used by Polish Army yet, and still needs some improvement. There is a chance that with a new Individual Battlesystem a new camouflage pattern will be introduced to replace older and not very effective wz. 1993 (Pantera and Pustynna Pantera). The older bullet-proof vest like OLV, KLV and UKO will be replaced by new integrated quick-release plate carrier. The wz. 2005 Kevlar helmet is a standard issue in the Polish Army and the MoD has recently signed a long term contract (2011-2018) with Maskpol to supply over 33,000 of them, but there is an open tender for over five thousand air and airborne assault units helmets, which turns out to have the similar requirements as the helmet described in the project design guidelines for Tytan system. The basic armament of the Tytan system soldier will be for the 5.56-mm modular rifle family MSBS-5,56 which consists of a carbine, standard assault rifle, light machine gun and sniper rifle and the 40mm modular grenade launcher both underbarrel and stand-alone. The rifle is designed by Warsaw Military University of Technology (WAT) and will be manufactured in the new Fabryka Broni Lucznik facility in Radom, planned to open in 2012. The MSBS-5.56 is based on a common upper receiver combined with lower receiver for classic or bullpup version of the rifle with fast-change barrel. Tests of four technology demonstrators were finished in early 2011, as well as the new design of the rifle was introduced. The next stage of development of the MSBS-5.56 system is expected in 2012. There are long-term plans to introduce the larger version of the MSBS as a designated marksmanship rifle fed by 7.62x51mm NATO ammunition. There is also a hybrid 30/5.56mm grenade launcher/assault rifle of an OICW-type called Neon under development which is considered part of the Individual Battlesystem, but it is not yet been determined whether it will be essential part of Tytan programme.